This looks like an easy solution for me since I am interested in playing audio through my vintage radios on different flloors of my home at the same time. Does anybody care to comment on what the audio quality will be with one of these? It sure looks like the range will be plenty. Are your "vintage" radios FM?? A std broadcast radio isn't going to receive it's signal.. Yes, of course they are FM. For a long time I used one of those car FM transmitters that were originally sold so that you could broadcast from a CD player (before they became a regular fit into cars) - ran it from a 12v wallwart and it covered my house alright. Then I found a kitset FM transmitter and coupled with a EBay MP3 SD card player works really well in a little disused speaker box. I have one of these. It works very well. The low power setting covers my entire house with a very clean and stable signal. Last edited by Steve Chambers on Mar Tue 06, 2018 2:32 am, edited 1 time in total. I have one of these and am very happy with it. I bought the kit and put it together. Canakits has some other FM transmitters with added bells and whistles like blue tooth interface. It has good range and fidelity. How is the volume when you have your FM radio tuned into your transmitters? Does the volume match what you are getting from normal local FM stations? Do these transmitters seem to be broadcasting your source with complete frequency response? The range on low power is more than adequate. Left and right channel line adjustment pots allow setting FM modulation to compensate for low input levels. Can be set to sound as loud as broadcast FM stations. Can you tell us how long the 9 volt battery lasts before it needs replaced? I got one of those C.Crane FM2 transmitter some time ago. I was disappointed with the range. The power output isn't stated, but from the enclosed info it says range 30-75 ft. I measured much less maybe mine is defective. It could be the power is low because they were concerned with FCC part 15. Various prices, free international shipping it says. This is the same chip that's in my little transmitter. I have no idea how long it would operate on battery. Mine is in an enclosure with a telescoping antenna and it runs off a separate 12 volt power supply. 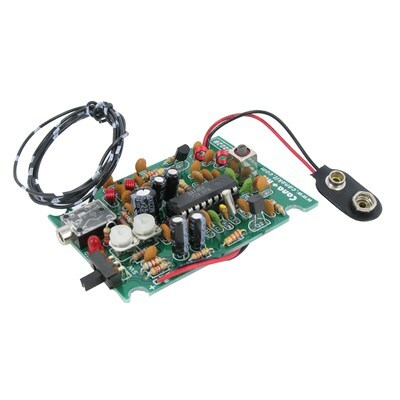 There is a 12 volt power option where you add a resistor to the circuit board. A bit of searching and you could probably get a better price, I did. FM stereo for the house and then some. Use it with XM radio, bluegrass 24/7, powered by usb port. I received this transmitter today and I must say it works much better than I expected. It feels like a high quality device, not the cheap made in China feel I expected. It has two power settings and I have been running it on low power and it easily broadcast to all three floors of the house. I have not tested how far away from the house it is transmitting but I will tomorrow using my car. As strong as the signal is in my house I figure it will probably go about 50 yards or so. The frequency response seems full and the output level can actually be turned up high enough that it will play louder than the loudest local Rock and Roll FM station. Stereo separation seems normal or at least on par with regular FM broadcasts. On my vintage German radios it is definitely a better sounding alternative to plugging the iPod directly into the "tape" or "phono" inputs. As we all know these old radios play surprisingly strong and loud with the FM radio but sound a little thin or flat when using the "tape" or "phono" inputs so this is quite an improvement over using those inputs. Looks like I have a great sounding solution to listening to my iPod on my old radios. I got the chance this morning to see how far away from the house this transmitter is reaching and I was surprised to be able to get good reception up to 1200 feet away. Does anybody know if this is a problem with violating some kind of rule or law? I think that may be a bit too far to be acceptable. The transmitter was set on it's lowest setting when I tested this. The transmitter is in the basement about 5 feet below ground level. If this is a problem is there a way to cut the transmitter power to an acceptable level. I'd like to know what the rules are also. I assume you set it to broadcast on a frequency that doesn't have a station in your area. If you don't interfere with someone else's reception you might be OK anyway. RF transmitters might be prone to damage if they don't "see" the proper antenna impedance, otherwise switching to another (smaller) antenna would cut down on range. You might use some type of attenuator between the transmitter and the antenna. Unlicensed transmitter operation in the FM band is exceedingly restrictive and is allowed only when verifiable field intensity measurements are conducted and kept on file for each installation. Regardless of the law, rules, or legal penalties, it's just good practice not to interfere with your neighbor's radios.